I know for sure my friends and I are growing up fast because all of us crazies who used to go out are now going out and doing crazy (good things). My friend Joon is a guy I know from way back in our Yonsei days (oh dear Lord, that was a good 7 years ago I just realized...) This knucklehead guy, who used to be my Sinchon drinking buddy (before we "grew up" to move on to Apgujeong for a bit) is spear heading a really cool movement to bring fresh, local organic, in-season produce and other food items to the tables of folks in Korea through an organization he's heading up called WWOOF Korea (World Wide Opportunities on Organic Farms). 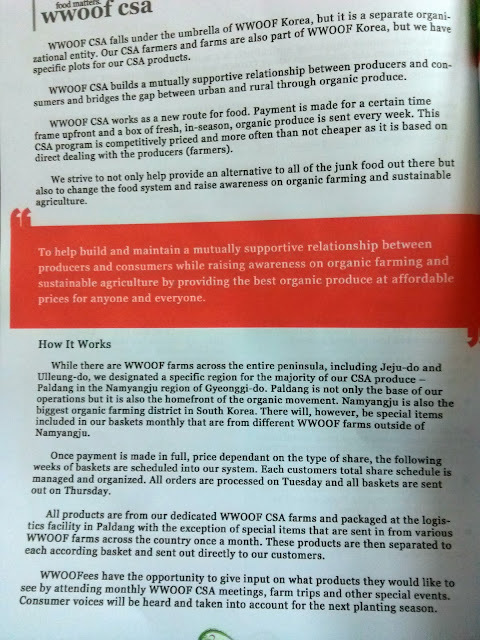 I know this is something Joon is deeply passionate about as he used to really dig in the points about the dangers of the current agricultural practices and methods of Korea's conglomerates and the benefits of organic and sustainable farming even years ago. But this guy took it a step further and has helped launch a really nifty program and movement around his passion and it's looking absolutely stellar. CSA boxes (Community Supported Agriculture) isn't anything new in places like my home country in the States but I would have never dreamed such a thing would get started and gain so much traction in Korea while I was here. With produce and many food in general already so expensive from the few arable land in Korea, I always thought organic foods would always be too expensive to be practical for the majority of consumers in Korea. 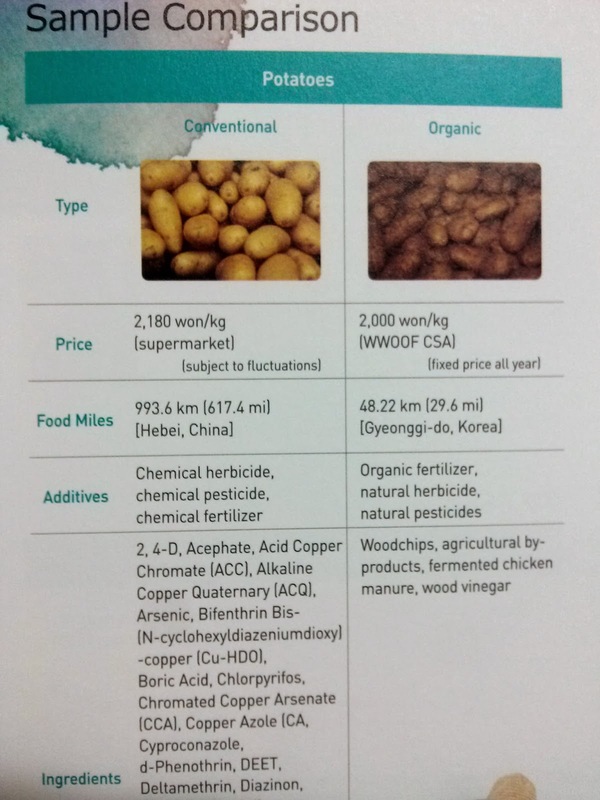 However, as WWOOF Korea has shown, it's not only possible but the economical, environmental and health benefits of this is something that people should really consider and talk about. Joon first messaged me about a week ago asking if I was interested in receiving a sample box and blogging about it which, of course, I was more than willing to say yes. Because I gave my shipping address so late, I hadn't expected it to come for another few weeks or so but, completely by surprise, the sample basket came in the mail today which I'm sharing the contents of which with you guys. I haven't tried any of the items yet so this is just a post on first look and initial thoughts before the tasting which I'll be sure to follow up soon. Opening the box itself was almost like opening a present except this present had wayyy more gifts inside than I even anticipated. The full contents I spread out on a little table to give you a show of what was included in my box. From left going clockwise- mixed greens, loaf of vegetable ciabatta bread, mulberry jam, matured potato and walnut bread, onions (2), pack of oyster mushroom (1), container of prepared spinach greens (1), a package of three yuza cookies, or snacks as they're listed in the basket information, half a dozen eggs, apples (2), garlic cloves, lettuce head (1). In the center of the picture are potatoes (2) and carrots (2). Not only are all the items organic but they're locally produced and items that are in season. I was surprised by not only the amount that was included in a weekly basket but the variety! They're commonly used items that can be added and prepared in versatile ways in dishes that are Korean or non Korean. All the items were fresh with a minor exception to some of the greens as just a very few of the leaves (but certainly not the majority) being a little wilted. I certainly don't mind a few limp greens and you can always freshen them up in a bowl of ice water but for finicky customers (especially the Koreans) even this minor thing could be a major complaint for them so I just wanted to point that little thing out for Joonster. Not sure if that was just the case with my box or if the way they're stored in the basket is causing any issue but that may want to be checked out lest any Korean ajummas raise up a fuss. But that truly minor thing aside, everything else on first glance was nothing short of exceptional. Nothing came damaged or looking premature or overly ripened. Organic produce tend to have a stereotype they're smaller, uglier and often filled with bug holes but again, nope, none of that going on here. If anything, the produce seemed fresher and even bigger in certain cases like the garlic cloves which looked jumbo compared to the ones I get at my neighborhood mart. The eggs come with a sticker label which lists who prepped them, the expiration date and it also clearly states that their hens are not given antibiotics but fed all natural feed. All three of the baked goods I received came from Paldang Food, which is an organic food company. The sticker labels give a clear account of each and every ingredient, including the percentage used, expiration date, where the ingredients come from and the nutritional information. With the exception of the grape seed oil and sugar, which is listed as coming from Spain and Brazil respectively, all the ingredients including the flour is from Korea. The packaging even lists that the packaging it comes in is polypropylene. For added reassurance, a number is provided at the bottom to call if a customer receives an inferior or defect product (1399 without the need to dial an area code). Included in the basket was a big envelope which contained a number of promotional pamphlets, a content list, and an in-depth read about WWOOF CSA. 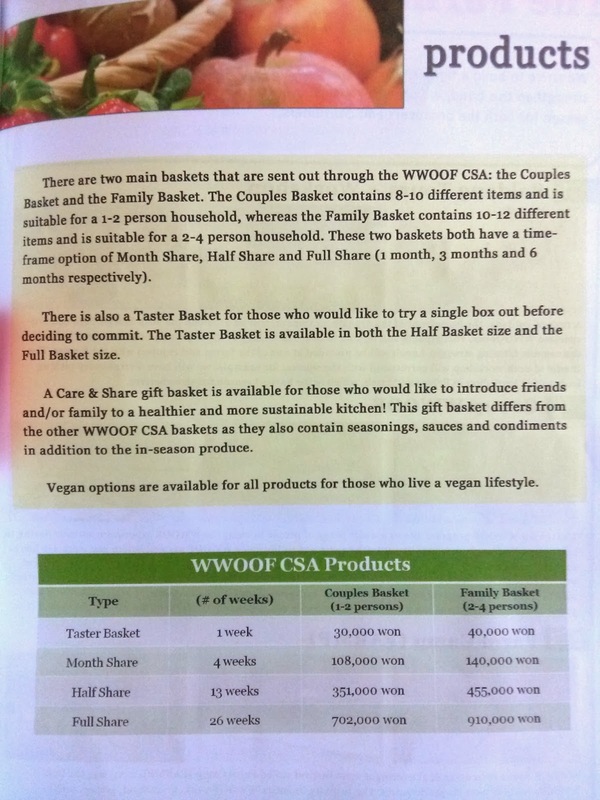 The sample basket content list makes clear what is what in your basket and also lists who was in charge of each item's care and growth, farm/company name and if they come from a region other then Namyangju which is the region where the bulk of WWOOF CSA's items comes from. 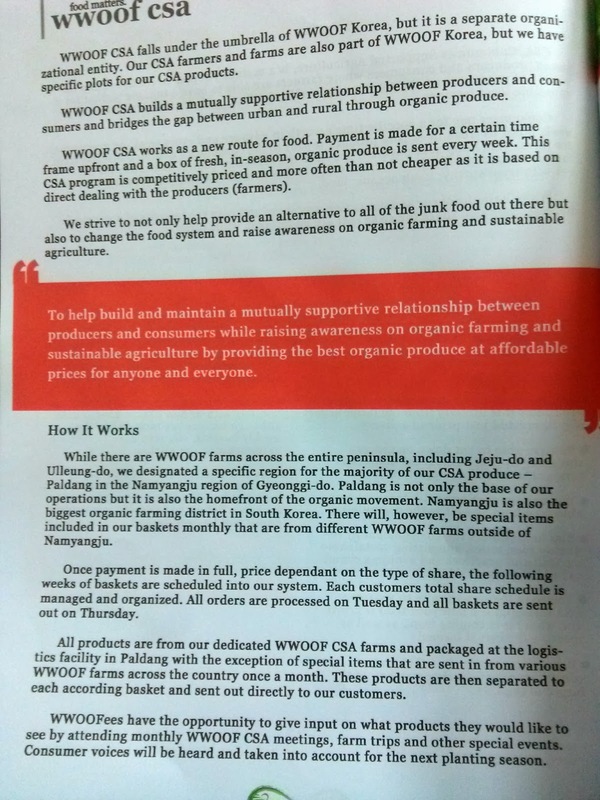 The WWOOF CSA "mini book" is very informative on not only what WWOOF CSA is about, but the benefits of purchasing and consuming community supported agriculture, how the system works, pricing and some of the other things WWOOF CSA does. I'm not putting up all the pages but you can get a basic read on some of the very detailed information it provides. The pamphlets adds detail on what to expect in your weekly baskets and some of the special items that are included monthly and seasonally. As you can see, with that sort of spread, you'd be hard pressed to grow tired of eating your weekly basket! Details on the pricing is listed below which includes special monthly plans that accommodate the size of your household. The couples basket will surely come in handy for the many who live alone or with one or two others. But no matter how many you live with, it's also a great way to split the costs to get fresh, in-season, organic items delivered right to your door- perfect for the busy ones who have less time to frequently hit up a store. And the prices, when you calculate what's all in the box, is VERY good. 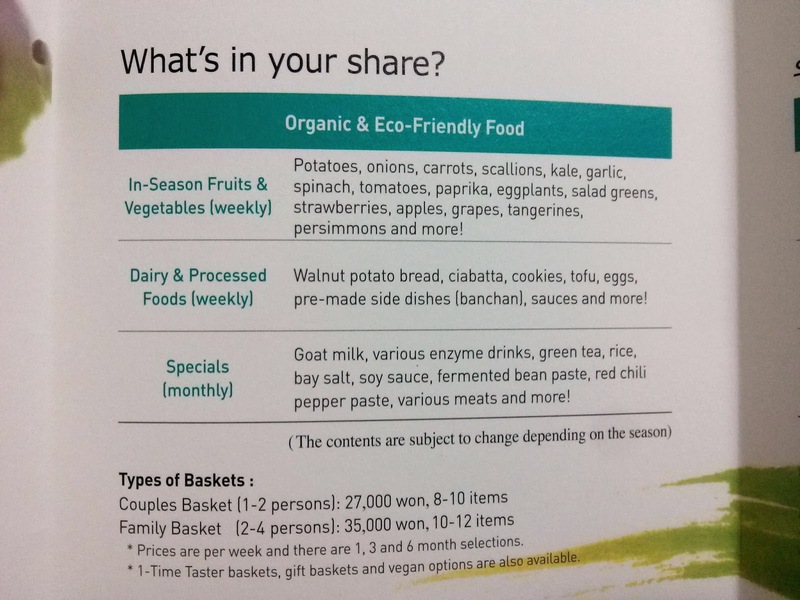 Vegan and certain other substitutions can be made which should be checked with WWOOF Korea directly. The pamphlet has a little blurb in Korean for the Korean speakers which is great but definitely needs to be expanded upon. But I'm sure this is something that will be done in the near future. As I said, I've yet to try anything yet but so far this is looking absolutely amazing. Of course, a part of me is all the more happier for Joon because I know this has been a long gestating dream and project for him which is finally coming to fruit, but even that aside and speaking without bias, this is looking very, very promising. I'll be sure to make a follow up post soon after trying out the goods but in the meantime, you can hit up their homepage, which is still being worked on, for more information and how to join. Be sure to also check out their FB page and "like" them for more news, pictures and other goodies!